Located in the northern Catskill Mountains, 20 minutes West of Hunter Mountain and 15 minutes to Ski Windham is Streamside, a unique, one of a kind luxury home. at Streamside is unique unto itself and walls of glass bring nature into all entertaining areas. Fall Foliage at Streamside is Spectacular and can be enjoyed from the heated pool. Streamside is ideal for a large group or family reunion. The property is more like a private resort than a private home with 5,000 sq. ft. of living space, allowing plenty of room to spread out. beds. 3 bedrooms have private baths. Bedroom # 1: (1) Queen bed & (1) Single bed. This bedroom has a private bath with double seat steam & shower enclosure (no tub) and his/her sinks. 6 baths, 3 of which are private. Two refrigerators, one of which is standard top mount freezer, with the 2nd an all refrigerator model. 6 burner Wolf Commercial stove with flat top griddle and double oven. Also Vulcan BBQ with ventilation hood in Kitchen. Massive, yet beautiful, space for a large group! This is house is MASSIVE! It comfortably fit our 18 person group without feeling like you are crowded or stacked on top of each other. We really enjoyed the two living rooms (one w/ a pool table), commercial kitchen (flat top grill, grated grill, stove tops, etc. ), and wrap around patio space. The stream running through the property is the icing on the cake. We originally went up to go skiing at the nearby mountains, but ended up relaxing inside the entire weekend. Looking forward to coming back here! The house was perfect for our group. Very clean and amazing space. Would rent from Ed again! Have been going there for 15 years now with a few families skiing in January, We love it! Great place to ring in the New Year! This was our seventh year celebrating at Streamside. It has enough room for everyone to have privacy and a great space for gathering to cook and play together. Between the pool table, hot tub, and extra family room there is enough to occupy both children and adults. It’s also a quick ride to go skiing or tubing. Our favorite place to be when the ball drops! 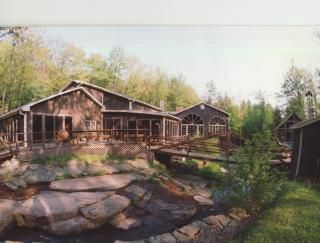 My family and I have been renting Streamside for over 20 years, all wonderfully memorable. We have gathered family and friends for vacations and celebrations. It is situated on a beautiful running stream, I love to keep my window open a crack and let the sound of the stream lull me to sleep. It has a massive kitchen, breakfast is alway a favorite meal because its fun and delicious to cook up pancakes and eggs on the professional grill. You can bbq all year round because there is an indoor and outdoor grill. There are 2 large living rooms, each with magnificent views of the property. In the summer season the heated pool is my favorite, and exiting the pool is never too chilly because there is always a sauna or jacuzzi to go to. We have even swam there on Columbus Day weekend in past years. I love to take advantage of the spa all seasons, especially the steam room. The pool table in the living room off the kitchen is also a big favorite. Streamside is near Hunter and Windham for the ski season, the most difficult part of going skiing is leaving the house because of its comfort. It is an excellent place for family and friend reunions. The fall season is also a great time to appreciate the foliage of the surroundings. Streamside has been in existence for many years and Ed, the owner, has been doing his best to upgrade his very large property and has made many upgrades including a new upper parking area, new floors, beds and bedding throughout the house and new rooms with private bathrooms. I have told him to update the photos of the place because they do not all reflect the renovations. I have read other reviews that mention some wear and tear of some areas of the house. If you let some minor unavoidable imperfections prevent you from renting this property you will certainly be missing out on lifetime memories. It is the perfect getaway if you are looking to spend special times in the country in a very special place. It is like having your own resort to yourself. Its the kind of place that your teenagers and their friends will actually want to return with you again and again. Its a place like no other. Ed's home is a little rough around the edges, but great for large parties who don't mind a lived-in aesthetic. The huge kitchen is perfect for preparing large meals and there is plenty of seating for dining. The pool table, jacuzzi, sauna and steam room were great for a rainy weekend indoors. Beautiful views of the stream and the surrounding property from two different living rooms, great for when not everyone wants to be doing and watching the same thing all at once. Would definitely recommend this house for a large group looking for a quick weekend getaway. 1) Pool House can be rented May to October at same seasonal per bedroom rate as main house (nightly/7) + $50 cleaning fee 2) Full week Friday to Friday house rentals preferred in Peak months of July and August with Weekend rentals considered in July and August on a case by case basis if can be paired with midweek rental.